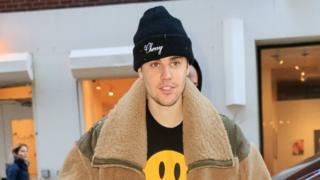 Justin Bieber has told fans that he's going to take a break from music to repair "some of the deep-rooted issues" he has. 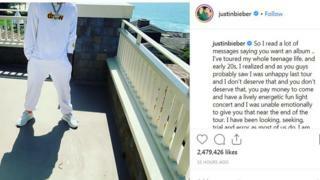 In an Instagram post published on Monday, the 25-year-old musician talked about the pressures that come with becoming famous at a young age. "Music is very important, but nothing comes before my family and my health", Bieber said. But he promised fans that he will return to music with a new album when he's ready. I've toured my whole teenage life, and early 20s, I realized and as you guys probably saw I was unhappy on my last tour and I don't deserve that and you don't deserve that. You pay money to come and have a lively energetic, fun, light concert and I was unable emotionally to give you that near the end of the tour. His wife Hayley Baldwin showed her support by replying: "That's right, love you so much it hurts!!!" Meanwhile, manager Scooter Brain added "Yes sir!!!!! ❤️❤️❤️👏👏👏👏🔥🔥🔥🔥🔥"
It's not the first time Bieber has posted about not feeling himself recently. Earlier this month, he posted on Instagram to tell fans that he'd been feeling "disconnected and weird".